Following the opening prayer, announcements and the Sargent-at-Arms, the speaker, Dublin A.M. Rotarian Sara Ott, Washington Township Administrator, made a presentation around her participation in the Rotary Group Study Exchange (GSE) trip to Rotary District 4620, in Sorocaba, Sao Paulo, Brazil in May of 2016. 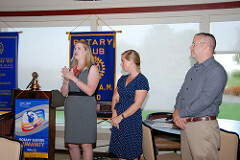 Assisting in the presentation were Michelle Ritchlin, of the Lancaster Noon Rotary Club and Will Fountain, sponsored by the Circleville Sunrise & Noon Rotary Clubs and employed at Nationwide Children’s Hospital. Others on the trip included Team Leader, Emilia Alonso-Sameno , President of the Athens, Ohio Noon Rotary Club, a professor of Spanish – Katie Schafer, sponsored by the Zanesville Daybreak Rotary Club, employed at Zane State College. The team traveled to three Host Cities. In addition to Sorocaba. They included Itapetininga and Cerqueria Cesar. In addition they visited nine other satellite cities. The GSE program was stopped by Rotary International in 2013, but revived in 2015 by Jan Zupnick and was completely funded by eight Rotary Clubs including – Dublin A.M.; Bexley-Whitehall; Dublin-Worthington; Columbus, Zanesville Daybreak; Circleville Sunrise, Circleville Noon and Marietta. A Brazilian inbound team is scheduled for 2017. During a Q/A session the three presenters answered a series of questions covering such topics as health care, education, living conditions, the coming Olympics and politics both in Brazil and the United States. In several areas, such as education and healthcare, they reported a noticeable disparity between rich and poor or as the presenters put it – between the haves and have nots. They were received very well in all places visited and spoke highly of the friendliness of the people. They also noted that Rotary Clubs in each location were among the leaders of the city and populated mostly by the well to do.